Rethinking The 17th Amendment: An Old Idea Gets Fresh Opposition : It's All Politics For more than 100 years, voters have been able to pick U.S. senators themselves. Some conservatives think the country would be better off if state legislators made the choice. 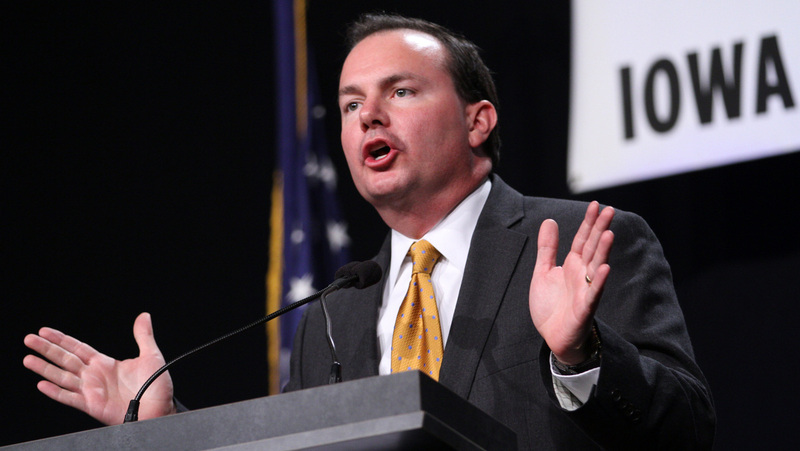 Sen. Mike Lee, R-Utah, speaks during the Iowa Faith and Freedom Coalition's Friends of the Family Banquet in Des Moines, Iowa, in November 2013. Lee is one of the few candidates calling for 17th Amendment repeal who have won office. It may be an idea whose time came and went 100 years ago. A number of Republican politicians and conservative commentators are calling for repeal of the 17th Amendment. Ratified in 1913, it gave voters the power to elect U.S. senators directly. Before that, senators were generally selected by state legislatures. Returning that authority to the states would give them much more sway in Washington, restoring their role as a check on federal expansion, repeal supporters say. "There's no doubt that was a major step toward the explosion of federal power and the undermining of the authority of the states," Texas GOP Sen. Ted Cruz said at a summit of the American Legislative Exchange Council, a conservative group of state legislators and businesses, back in December. The issue has come up in any number of campaigns over the past decade, but it hasn't caught on much as a voting issue. It takes a while to explain the history and why trying to reverse it — by taking away or diminishing the effect of popular votes for Senate — would be a good thing. Even proponents don't think there's any foreseeable chance of jumping all the hurdles involved in rewriting the Constitution. But giving states themselves — as opposed to individual voters within states — more of a voice in Washington is an issue with considerable resonance among parts of the conservative coalition. As things stand, letting legislatures decide would guarantee Republicans a majority in the U.S. Senate. The GOP currently holds majorities in both chambers in 26 states, along with effective control of the nonpartisan Nebraska Legislature. Democrats control 18 legislatures, with the others split. "You'd have to educate people about what the 17th Amendment is all about and what the repercussions are," says Republican Jim McKelvey, who pushed the matter in his unsuccessful campaign for the Virginia House of Delegates last year. "State sovereignty has been trounced on. It's one of the big problems." The 17th Amendment was one of several innovations during the so-called Progressive Era meant to promote direct democracy, such as ballot initiatives, recall elections and party primaries. The idea was to circumvent the stranglehold that various monopolies and oligarchies had on state officials of the day. "The state legislatures were just a mess, especially with regard to this issue," says John Hibbing, a political scientist at the University of Nebraska who has studied the amendment. "People were just buying their way in. It was a real cesspool." But taking away the influence state governments had in Washington — the states themselves — dealt a "critical blow" to the federalist system, popular conservative talk radio host Mark Levin argues in his book The Liberty Amendments: Restoring the American Republic. "Providing the state governments with direct input in the national government was not only an essential check on the federal government's power, but also a means by which the states could influence congressional lawmaking," Levin writes. Levin calls the amendment "an object lesson in the malignancy of the Progressive mindset and its destructive impact." Indeed, the lineage of the 17th Amendment is something its critics hold against it. Frank Niceley, a Republican state senator in Tennessee, says 1913 was "an unlucky year for Americans," because it ushered in not only direct election of U.S. senators but the Federal Reserve and the income tax. Niceley expects a vote next month on his bill to allow his state's Legislature to select the nominees of both major parties. Democratic legislators would pick their party's nominee, while Republicans would pick the GOP candidate. Minor parties would still select nominees by primaries or conventions. Voters would then have the final say in the general election, as they do now. Niceley says his proposal would shorten the campaign season and could increase senatorial turnover. Niceley contends that just floating the idea has succeeded in giving state legislators a lot more say with senators in Washington. "When I call now, they call back," he says. Niceley's bill may not pass, but it's a way of addressing the issue without attempting to overturn a constitutional amendment. Even before the 17th Amendment took effect, citizens often had a say in who served as senator. In the decades leading up to its ratification, many states followed the Nebraska model in which legislatures considered themselves bound electors, obligated to anoint senators who had already been selected by voters. There's nothing to indicate today's voters would be thrilled with the idea of losing their right to cast direct ballots for senators. Most of the candidates who have touted the idea in recent years have lost, with a few exceptions including Utah Republican Sen. Mike Lee. In Texas, two of the leading candidates in the heated GOP primary for lieutenant governor originally touted the idea of repeal, but have since reversed course. A YouGov poll last November found that voters preferred direct elections over state legislative selection by a 60 percentage point margin. "I just don't see how it could possibly be a winner for anyone running," says University of Illinois political scientist William Bernhard. "To say we're going to become less democratic and have fewer votes, that doesn't resonate."